I’ve written a novel about a young woman who thinks falling in love will turn her into a fully functional adult. I’ve also written a guide to help couples plan the music for their wedding ceremonies. My career as a harpist informed both of my books. But my experience in matters of love and marriage extends beyond my professional life. I once was a bride. Today my husband and I celebrate out 16th anniversary. (Silver hollowware is the appropriate modern gift for 16th anniversaries, in case you were wondering. I’ve interpreted that to mean a bottle of Herradura Silver plus a pair of tickets to see Jake Gyllenhaal in Sunday in the Park with George. Shh! Don’t tell my husband.) It has been 17 years and six weeks since I accepted K’s proposal. I’m a feminist, and K is woke. And yet, he’s the one who proposed. He did so on one knee in the kitchen. I was barefoot. Hmm. We opted to spend the first couple of months savoring being engaged rather than jumping into the fray of wedding planning. This decision left us with plenty of time to gaze into each other’s eyes and smile. We put off tiffs about what color table linen’s we should use for the wedding reception. (Wait — we never had that fight. Were we supposed to have?) Admittedly, it was easy to delay the planning process as I spent most of February — including Valentine’s Day — away from my fiancé while I worked as an entertainer aboard a cruise ship traversing the Panama Canal. Sadly, by the time K and I made plans to tie the knot, my mother was too ill to be a part of the festivities. My sister and future mother-in-law lived out of state. And so I planned our wedding day mostly alone. This suited me just fine. I work well by myself. Researching and organizing come naturally to me. And it didn’t hurt that I knew a thing or two about weddings after having played a few hundred of them. This is not to say I shut my betrothed out of the process. Or my dad, who generously footed much of the bill. Starting with the venue, we jointly agreed it needed to have windows overlooking scenic grounds, be handicapped-accessible, and be host to only a single event at a time. I chose a country club whose banquet manager had hired me to play her wedding a few years earlier. K chose the venue where he first embraced his new career playing wedding ceremonies and cocktail hours (did I mention I married a musician?). My father chose a site he knew from pleasant business dealings. Happily, we all chose the same venue. For two wedding musicians, selecting our music was no more challenging than agreeing on a venue. Harp was right out. I didn’t want to see a harp at the far end of the aisle and panic because I thought I was late to the gig. And yes, I did wear a watch right up until the minute I began processing. We commissioned a good friend, a brilliant composer, to compose our processionals and recessional. Knowing he wrote his doctoral dissertation on the topic of complexity in music, we hired a string quartet led by a former member of the New York Philharmonic who would have the chops to learn difficult music. For the reception, we hired another friend who had written arrangements for big band to put together an ensemble. He was so good at recruiting talented musicians for his gigs that he lost a succession of them to major jazz artists. We were rocking out on the planning process. And then our bandleader signed a contract to go on the Footloose Broadway tour six weeks before our wedding. And our banquet manager’s husband was transferred out of state. The hostess from the country club’s restaurant was promoted to banquet manager, and ours would be her first event. Being in the biz, we had myriad solutions to our band issue. I decided whichever band we hired had to have an accordion player. Don’t judge. Polka band, French chanteuse, I wasn’t going to be picky. Thankfully, I knew an accordion, violin, and bass trio, and they were part of a Zydeco band that played wedding receptions. Done! While playing other couple’s ceremonies, I had heard banquet managers advise brides to look only at the groom when they processed. I eagerly anticipated fixing my attention on K. My betrothed couldn’t have been more handsome, and I would have been content to make moony eyes at him as I walked down the aisle. But seated between us were 100 people whom we loved and who loved us. They turned to watch me walk. I couldn’t keep from smiling at them as I processed. The beauty of their expressions and the love I felt from our community brought unexpected joy to the start of our wedding celebration. As I neared the altar, something snapped me out of my bubble of bliss. The bridesmaids lined the aisle, standing at a 90º angle from the groomsmen fanned out on the opposite side. Set up where the women should have been standing was our string quartet. When I watched the video of our ceremony, I saw the first bridesmaid (a flutist) look quizzically at the musicians as she found a new spot to stand. The third bridesmaid (a violinist) did the same thing and then shot the flutist a look. The inexperienced banquet manager hadn’t yet learned where to set ceremony musicians, and my concert-quality string quartet didn’t know to question the set-up location. But, who cares? 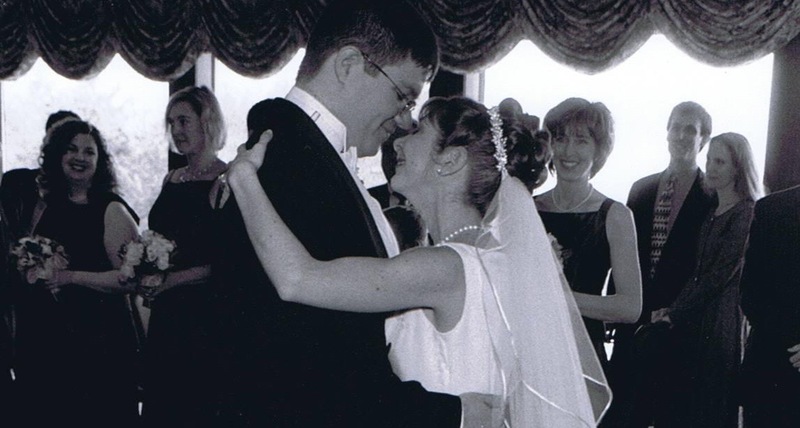 I married the love of my life 16 years ago. With or without an experienced banquet manager, the original band we hired, or a string quartet blocking the way, we were going to say, “I do.” Gorgeous flowers, the perfect first dance song, signature cocktails. Each detail can make a wedding day an ideal reflection of a couple’s personalities. In the end, though, every detail you plan for your wedding takes a back seat to the love that brings you to the altar.